As “the Jewel of San Diego,” La Jolla is famous for its beautiful coastline and cliffs as well as its multitude of restaurants serving fresh seafood and delicious eats. Experience the flavors of Southern California reflected in each restaurant’s menu with seasonal, locally sourced ingredients prepared simply. 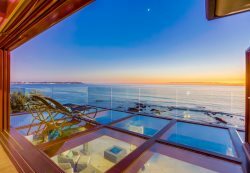 Just minutes from your La Jolla vacation rental, dine on tacos, steaks, burgers, sandwiches, pizza, pasta, fish and much more. View restaurants in La Jolla Shores, La Jolla Cove, downtown La Jolla and Bird Rock. Nestled in La Jolla Shores, Piatti features an exhibition kitchen, stone-hearth oven, full-service bar and a tree-covered patio perfect for dining al fresco. Their menu, crafted from recipes from all over Italy, offers seasonal cuisine with an emphasis on local farms and producers. Open for lunch and dinner, their dishes include a selection of antipasti, salads, paninis, pizza and pastas. Overlooking beautiful La Jolla Cove, Brockton Villa Restaurant is housed in a historic beach cottage. Its seaside location offers spectacular views and a seasonal selection of upscale breakfast, lunch and dinner entrées created by Chef Mareyja Sisbarro. Dine on seafood, signature salads, steaks and more. Healthy, vegetarian and gluten-free options are available. Mention Bluewater and enjoy a complimentary dessert with the purchase of any entrée. Duke’s La Jolla is named after the famous native Hawaiian surfer, Duke Kahanamoku, an Olympic swimming and water polo medalist and the father of modern surfing. As a tribute to Hawaii and Southern California beach lifestyles, Duke’s celebrates family, beautiful scenery and the spirit of aloha. Overlooking La Jolla Cove, Duke’s serves contemporary interpretations of traditional island plates for breakfast, lunch and dinner. Voted “Best Seafood” in 2018 in La Jolla Village News, Crab Catcher serves up seafood fresh from the boat to the table in a beautiful ocean view location. Family-owned and operated for more than 35 years, the restaurant specializes in locally sourced hook-and-line caught fish, wild-caught shellfish from the Baja Peninsula and Bering Sea red king crab legs. Enjoy brunch (Saturday and Sunday), lunch and dinner. Listed as one of San Diego’s “10 Best Foodie Spots” by USA Today, George’s at the Cove is actually three dining establishments in one with views of the ocean. The main restaurant, California Modern, features inventive fine dining with locally grown and harvested ingredients. Level2 offers classic and innovative cocktails with house-made ingredients and hand-cut ice along with lunch and dinner. Ocean Terrace serves casual lunch and dinner selections like fish tacos, salads, sandwiches, pasta and more. Situated near the La Jolla Coast Walk shopping district, Eddie V’s presents elegant fine dining with an array of tender steaks and fresh seafood, like raw oysters and Pacific Ahi tuna, made from the freshest ingredients. Local tip: Arrive early and enjoy live jazz music at the bar, hand-crafted cocktails and exquisite appetizers before dinner. Jose’s Court Room presents authentic Mexican food with a modern twist and breathtaking ocean views. Find traditional Mexican dishes along with local favorites like ceviche and veggie burritos. Everything from sauces and sides to chips and salsa are made in house. Their bar features an unparalleled craft margarita and cocktail menu using fresh ingredients and high-quality spirits in addition to Mexican and local craft beers. With its flagship location in La Jolla, Herringbone showcases “fish meats field” coastal cuisine with an emphasis on line-caught seafood and high-quality meats. Experience an ocean-to-table culinary excursion with a raw bar, exhibition kitchen and al fresco dining under 100-year-old olive trees. Enjoy brunch, lunch and dinner. Don’t miss Oyster Hour with food and drink specials, 4–6 p.m. daily, and all night on Mondays. Founded in La Jolla, The Taco Stand was inspired by the taco stands of Tijuana. Savor an authentic taco experience with handmade corn tortillas, high-quality meats and made-from-scratch daily guacamole and salsa. Offerings beyond tacos include burritos, quesadillas, Rosarito-style churros and Mexican-style popsicles. With locations throughout the country and several in San Diego, Burger Lounge is a modern burger spot serving grass-fed beef, free-range turkey and organic quinoa burgers. This casual restaurant also offers chicken and fish sandwiches, salads, shakes, floats and a gluten-free menu. The first Prep Kitchen opened in La Jolla in 2009. Now with five locations, Prep Kitchen showcases a menu firmly rooted in the mastery of cooking combinations influenced by the surrounding neighborhoods and seasonal bounty of California. The menu evolves continuously utilizing the inventive talents of their chefs along with thoughtfully sourced products. Enjoy lunch, dinner and Saturday and Sunday brunch. Whisknladle takes a back-to-basics approach to cooking. It delivers elevated comfort food that satiates the senses. Listed as one of Condé Nast Traveler’s best new restaurants in the world, Whisknladle presents an eclectic yet familiar menu that encourages you to indulge. Ingredients are simple, seasonal and as much from scratch as possible. Stop by for handmade pastas, delicious salads, fresh seafood and more. Located in the heart of La Jolla’s Bird Rock community, Beaumont’s Eatery is popular among locals for fabulous food, hand-made cocktails and top-rate entertainment in a casual, yet contemporary atmosphere. As a sister restaurant to Brockton Villa, Beaumont’s serves breakfast, lunch and dinner along with a happy hour featuring drink and food specials. Favorites include fried chicken, mahi tacos, burgers and salads. Mention Bluewater and receive a voucher for a complimentary selected share plate with the purchase of any entrée. Voted “Best Wood-fired Pizza” in 2018 by La Jolla Village News, Wheat & Water specializes in wood-fired pizza, shared plates, salads and charcuterie created from simple, locally sourced ingredients. It also features a variety of beer from local and national breweries, wine, and original cocktails. Locals love the crispy Brussels sprouts and the pastrami-cured pork belly pizza.